Yep..there are lots of us out there hand crafting each tiny work of art by hand and we all like to share our passions. The possibilities are endless…there are glass beads, porcelain beads, ceramic beads, seeded beads, clay beads, metal beads, felted beads… and each componant adds a unique flavor to your final creation. 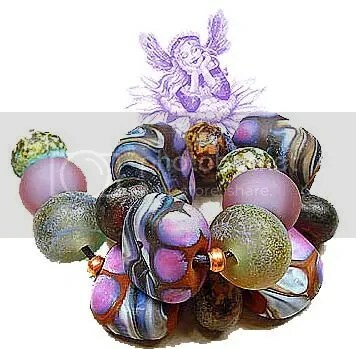 Brew yourself up a cup of tea and cuddle up to your laptop because I’ve gathered up a selection of interesting artisan blogs that focus on the art of beads…enjoy! Another well known artisan among beady peers is Anne Choi..Each of her silver beads is handcrafted..yes. Most have words of wisdom for your soul. Enjoy these few links fellow bead lovers… add something new to your creations. Or just become inspired. If you have the time! you can also learn to create jewelry componants for yourself. Have yourself a great week! § One Response to >Busy Beader blogs ..
>Well I have certainly got my reading cut out for me! Thanks for the links…off to check them out! You are currently reading >Busy Beader blogs .. at fireandglass.